Forget pallets at your peril when designing automated systems. Better performance and substantial cost savings can be achieved through integrated design. Ralph Rupert, manager of unit load technology for Millwood Inc., spoke on the topic, ‘Pallet Performance in Automated Storage Systems’ at ProMat 2017. Millwood is a national pallet supplier headquartered in Ohio with manufacturing operations and supply partners throughout the U.S. Ralph, former director of the Center for Unit Load Design at Virginia Tech, helps Millwood account managers develop the proper pallet design for customers. “One of those areas that we often run into is automatic storage and retrieval systems,” he said. His remarks focused on the variables that are considered in pallet design. How a pallet interacts with an automated handling system depends on several factors, he noted: the size of the pallet, the direction of travel, lifting limitations, friction, load capacity and deflection. As to size, while most people think the standard 48×40 pallet is the predominant pallet design, it represents only about 30 percent of new pallets that are manufactured each year, according to Ralph. Over 50 percent of new pallets are odd sizes. He referred to a Millwood customer that requires 105 pallet designs. Another uses a 42-square pallet at all of its eight plants, but the design of the pallet is different at each one. The American National Standards Institute (ANSI) has a standard for pallets, and it is published by the MHI. (Ralph chairs the ANSI committee that is responsible for the standard.) “It’s a good standard,” he said, “and more and more people should be using it.” A show of hands indicated only three people in the audience were familiar with the standard. The latest version of the standard was published in 2016 after a 10-year process and is available as a free download from the MHI website. (Click here to download). It includes updated information for pallets made of non-wood materials, including metal, plastic, and paper-based as well as information pertaining to pallets for U.S. military applications and automated storage and retrieval systems. 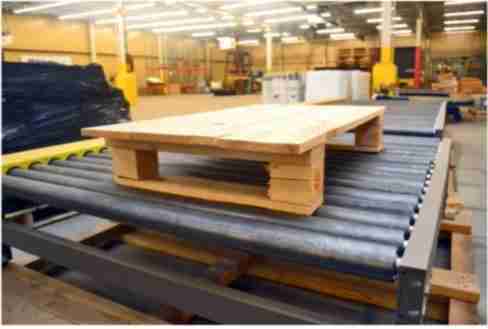 For example, the standard as related to pallet size allows a variation of +0.125-inch to -0.250-inch for length and width and +0.125-inch to -0.325-inch for height. “This is the bad direction,” said Ralph, referring to a slide showing a pallet oriented so the bottom deck boards were parallel to the rollers. The photograph showed the bottom deck board just barely spanned two rollers compared to the other direction, in which the bottom deck boards spanned seven rollers. 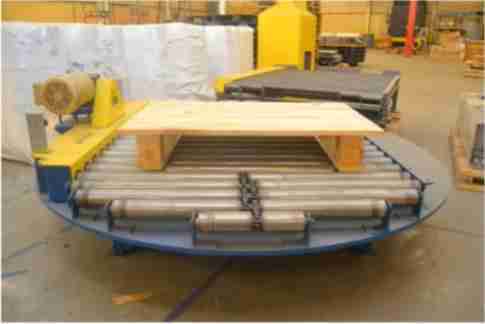 Barely spanning only two rollers will cause vibration of the pallet as it is traveling down the roller conveyor toward the stretch wrapper, said Ralph. Vibration will cause swaying and the load to “mushroom,” he said. 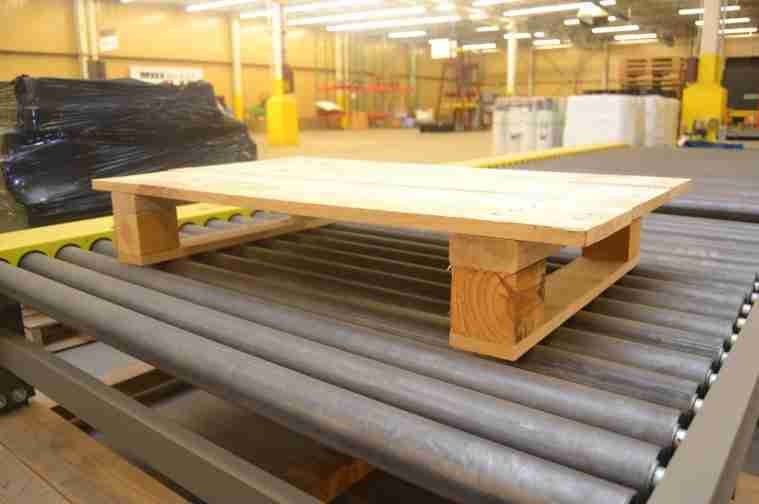 He had visited a customer recently where the pallet was oriented correctly, but the conveyor had widely spaced rollers. In the 20 feet the pallet traveled from the palletizer to the stretch wrapper, the top layers of plastic bags of product mushroomed outward 6 inches because of uneven travel. The stretch wrapper had to pull product back within the pallet footprint. The company invested in additional rollers to solve the problem, which allowed it to reduce the amount of stretch wrap it needed to use. “It goes back to understanding those interactions between the pallet the handling system, and how costs may be reduced by managing those interactions more efficiently,” Ralph said. Direction change can be a bottle neck for conveyor systems. Another factor in direction of travel is whether there is a change of direction sequence — turning the pallet 90 degrees, for example — and what equipment is used to accomplish that change, such as a turntable or a transfer chain. Both work well, noted Ralph, although a turntable slows down throughput. Ralph told a story that emphasized the importance pallet opening and friction considerations. Several years ago, a customer visiting the Virginia Tech pallet laboratory thought he had an issue with a plastic pallet related to friction. The case was unusual because the customer thought the problem was that the pallets were too slippery on the facility floor, which is not normally a problem point concerning friction. Normally, the issue of friction is related to the pallet not sliding off forks or rollers, or product not sliding off the deck of the pallet. On visiting the customer location, many dislodged rubber grommets on the floor were observed. Grommets are used to increase friction, including on the bottom face of the pallet so plastic pallets are not too slippery for safe handling with steel forks. It turned out that the customer had specified plastic pallets with a three-inch opening and that the pallet jacks being used to move the pallets required a 3.5-inch opening. The jack forks were being jammed into the pallets, popping loose grommets, and pallets were sliding on the floor because of the tight fit. In this case, what the customer believed to be a friction problem was, in fact, a problem of the pallet opening not being high enough to accommodate the material handling equipment being used. Load capacity refers to how much weight the pallet can support. In this case, our interest is how much weight can a pallet safely handle in automated system. Two test protocols used in this determination are ASTM D1185 and ISO 8611. For wood pallets, two computer software programs are available to analyze pallet design and load capacity and performance, noted Ralph. One is the Pallet Design System, which first entered the market in the 1980s and is licensed by the National Wooden Pallet and Container Association. The other he cited is Best Load. “Again, it comes back to understanding the interactions of the product, the pallet, and in this case, the material handling system,” Ralph emphasized. is already built into the calculation. with a 0.25-inch maximum to be cautious. For example, a pallet that deflects or bends too much under load will drag against the inside of a skatewheel conveyor, he noted. In applications where that type of conveyor is used, testing for deflection needs to look at the span of the pallet from skatewheel to skatewheel. Performance testing of pallets will determine averages, noted Ralph, and factors are used to set benchmarks or standards. In determining pallet failure, for example, a safety factor of 2.5 is used in the calculation of the maximum safe load. If a pallet breaks at a test load of 5,000 pounds, using a factor of 2.5, the pallet initially would be rated at 2,000 pounds for a safe load. (5,000/2.5). In testing for deflection, he uses a figure of 125 percent of the safe load, which would be 2,500 pounds. The pallet is acceptable if it deflects less than the protocol for that particular pallet design. Using the 125 percent factor and for an average deflection limit of 1.9 percent of free span, a 44-inch free span on a 48-inch pallet would have an acceptable deflection limit of 0.84-inch. “That’s pretty significant,” observed Ralph. However, in warehouse and distribution center operations, 0.5-inch clearance is required for most shuttle carts in automated storage and retrieval systems. That is the ANSI standard and typically what is followed in most automated systems. That’s why it is important to interpret pallet performance data in light of pallet specification literature that is based on testing protocols, Ralph suggested. The design software programs load capacity output is a forward analytical tool, he noted. The user inputs the pallet design criteria — such as design, deck board material and dimensions and other factors — and the software calculates performance results. The program does not function in reverse, to allow the user to select or pick a performance result and subsequently determine the pallet design, material, and dimensions, etc. Pallet applications for automated storage and retrieval systems often restrict allowable deflection to ensure the pallet under load will be compatible with material handling equipment, Ralph noted. The safety factors built into the software can help determine pallet designs that will provide the amount of clearance required. It is important to remember that a safety factor is already built into the calculation. If customers need a pallet with 0.5-inch maximum deflection, they do not need to order a pallet with a 0.25-inch maximum to be cautious. The safety factor is already serving as a precautionary measure. By specifying the lesser deflection of 0.25-inches, a stronger pallet will be required that may result in a significant increase in cost. For one customer, the extra deflection reduction increased pallet price from $20 to $35. In closing, Ralph reminded the audience that the pallet is the interface for the customer’s product, the product packaging, and the material handling system. In addition, pallet performance and specification are as important as any piece of equipment in the material handling system. In fact, the pallet should be considered as part of the system. And finally, do not assume that a customer will know what pallet to buy for their material handling system, as in the case of specifying a quarter inch deflection when only a half inch deflection is required. “All these interactions really need to be understood to properly design the pallet,” said Ralph, referring to the interactions of the pallet with everything from the pallet jack and forklift to more sophisticated handling equipment and transport vehicles.